Laura Brandon's promise to her dying father was simple: to visit an elderly woman she'd never heard him speak of before. A woman who remembers nothing--except the distant past. Visiting Sarah Tolley seemed a small enough sacrifice to make. "Chamberlain explores psychiatric tensions in this disturbing story of dark secrets and redemption . . . the story offers relentless suspense and intriguing psychological insight (Chamberlain is a former psychotherapist) as well as a satisfying love story. "Chamberlain deserves the highest praise for writing this emotionally compelling story of secrets and silence, love and lies. Breaking the Silence is as real and emotional as a novel can be." 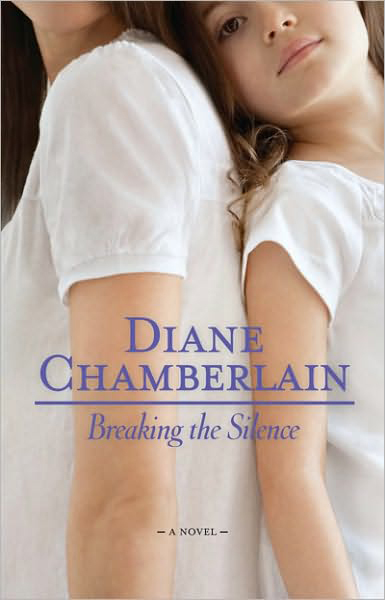 "Breaking the Silence is a riveting puzzle that slowly comes together, drawing readers along every step of the way." The phone rang a few minutes after eleven on Christmas night. Laura was at her computer in the study, as usual, but she quickly reached for the receiver. She knew who was calling. "He's asking for you," the nurse said. "I think you'd better hurry." She ran through the living room, past the darkened Christmas tree and up the stairs to the second floor of the townhouse. Although she tried to be quiet, the bedroom door squeaked as she opened it, and Ray lifted his head from the pillow. He was never an easy sleeper. "The hospital called," she said, slipping off her robe and pulling a pair of jeans from her dresser drawer. "I have to go." Ray sat up and switched on his bedside light. "Is he . . . "? He didn't finish the sentence as he reached for his glasses on the night table. He looked dazed, blinking against the intrusion of light in the room. "He's still alive," she said. "But I think this is it." She heard the lack of emotion in her voice as the calm and collected scientist in her took over. "I'll come with you," Ray said, throwing off the covers. "I'll get Emma up and she and I can wait in--"
"No." She pulled her sweater over her head, then leaned over to kiss him. "You and Emma stay here. No sense waking her up. Besides, I need to get there quickly." "All right." Ray smoothed his hands over his thinning brown hair. "But call if you change your mind and want us to come." He looked like an oversized little boy, sitting on the edge of the bed in his striped pajamas, and Laura felt a quick surge of love for him. "I will," she said, giving him a hug. "Thanks." Outside, the air was still and cold. She drove quickly through the neighborhood, the houses and trees ablaze with colored lights. On the main road through Leesburg, she hit red light after red light, and even though the streets were nearly empty, she stopped dutifully at each of them. Her father had wanted no heroic measures, and he'd received none. Although Laura agreed philosophically with his decision, her emotions were another matter, and these past few days she'd been hoping for a miracle. She wasn't ready to lose him. Carl Brandon had been the one consistent person in her life, always there for her. Her relationship with him had not been perfect, but who had a perfect relationship with her father? He'd turned eighty a few months ago, right after the cancer came back. She'd given him a party after hours in the Smithsonian's Air and Space Museum, turning on the planetarium lights for him. It would be his last party, and she knew there was nothing he would love better than to gaze at the sea of stars above him. He'd nearly ignored the guests in favor of the mechanically created sky. Only a few cars were parked in the visitors' lot, and she found a spot close to the hospital entrance. Inside, the lobby was eerily empty and dimly lit. Shivering as she walked through it, she tried to prepare herself for what lay ahead. She would find her father at peace. He was not afraid of dying, and that comforted her. He had an astronomer's appreciation of his own irrelevance. When your passion was the sky and the stars and the planets, the insignificance of your life was a given. So, she would hold his hand as he drifted away from her. She would be very strong. Then she would drive home and Ray would comfort her. In the morning, she would tell Emma that Poppa had died. She had already tried to explain to her five-year-old daughter about Poppa's illness, trying to equate what was happening to him to what had happened to Emma's guinea pig the year before. But Emma, despite asking dozens of questions, seemed unable to grasp the concept of forever. And Laura, who had always scoffed at the notion of heaven, found herself using the idea to comfort Emma. And at times, herself. She knew the instant she entered her father's room that he was not at peace. He was clearly worse than when she'd seen him that afternoon. His breathing was raspier, his skin grayer, and he was agitated. As he reached for her, his long arms trembling in the air, he wore a look of desperation on his once handsome face. She took his hand and sat on the edge of his bed. He held both her hands in his weak grasp, but even with her there, the desperate look did not leave his eyes. He tried to speak, the words coming out between his gasps for air. "Should . . . have . . . told . . . " he said. She leaned close to hear him. From that angle, she could see the stars of Aries through the hospital window. "Don't try to speak, Dad." She smoothed a tuft of white hair away from his temple. "A woman," he said. "You need . . . " Her father's face, gaunt and gray, tightened with frustration as he struggled to get the words out. "I need to what, Dad?" she asked gently. "Look . . ." His lips trembled from the strain of speaking. "Look after her," he said. Laura drew away to study his face. Could he be delusional? "Okay," she said. "I will. Please don't try to talk anymore, now." He let go of her hand to reach toward the night table, his arm jerking with the motion. Laura saw the scrap of paper he was aiming for and picked it up herself. Her father had written a name on the paper in a nearly illegible scrawl that threatened to break her heart. "Friend," he said. "Important . . . has no . . . family." He swallowed with effort, his Adam's apple a sharp blade beneath the skin of his throat. "Promise." He wanted her to look after a woman named Sarah Tolley? "But . . . who is she?" Laura asked. "Where is she?" His eyes were closed. "Meadow . . . Wood . . . "
"Meadow Wood Village?" Laura pictured the attractive Victorian-style retirement home on the outskirts of Leesburg. He nodded. At least she thought he did. "Can you tell me what you want me to do for her?" she asked. "Take care . . . "
"Take care of her?" Laura asked. "But I don't know her, Dad. I've never even heard you talk about her before." Her father's paper-thin eyelids fluttered open, and she saw panic in his eyes. "Promise!" he said. In a nearly spasmodic movement, he reached toward her as if trying to grasp her shoulders, but he caught his fingers in the chain of her necklace instead. She felt the chain snap, and the pendant fell into her lap. Unsettled by his panic, she caught his hands. "It's all right, Daddy," she said. "I promise. I'll take care of her." "Swear . . . "
"I'll do it, Dad." She leaned back to slip the scrap of paper into her jeans pocket. "You don't need to worry." He sank back against the pillow, pointing one trembling finger toward her neck. "I broke . . . "
"It's all right." She lifted the necklace from her lap and slipped it, too, into her jeans pocket. "It can be fixed." She took his hand again and held it on her thigh. "You rest now," she said. Obediently, he closed his eyes, their small battle over. Small battles were nothing new between them. Her mother had died when Laura was seven, and her father had been a difficult parent, demanding and controlling, but always attentive. She had been his top priority, and she knew it. He'd instilled in her his love of astronomy, although for him it had been a cherished avocation rather than a profession, and he was responsible for the person she'd become. His methodical shaping of her had at times been painful and contentious, but she was grateful for it. She sat there for hours, holding her father's hand as it grew slacker and cooler in her own. Taped to the wall was a picture Emma had drawn for him a few days earlier. It was one of those typical five-year-old's drawings. Vivid blue sky. Yellow sun. Green tree. A child dressed in blue and purple, wearing a broad smile, the sort of smile Emma herself wore more often than not. Laura studied the drawing, saddened by the incongruity of that happy child with the scene in this room. She looked out the window again. Aries was gone, but she could see Jupiter near the center of Aquarius. She closed her eyes, and it was a minute before she realized that her father's breathing had stopped. Sitting very still, she held his lifeless hand in hers, as the room filled with a silence as deep as the sky.